From 11th to 13th of July, the members of ORACLE’s project coming from the 20 different countries that are part of the project meet in Panama with the purpose of constitute the headquarters in UDELAS university. At this meeting, not only the members of the project will attend, but also institutional representatives of the universities that are part of ORACLE’s project. During the days of the meeting, work sessions will be developed, which will help to carry on with the objectives of the Project. In these sessions, the members of the Project coming from the institutions represented in it will participate actively. At the same time, on 12th and 13th of July rectors and vice rector of universities will attend representing Latin-American institutions that participate in the Project and they will formally present ORACLE’s headquarters in the building of UDELAS. The participation of the highest institutional representatives in this meeting has two objectives: on one hand, obtain their engagement with enhancing the regional observatory, as well as the units of quality in equity of their own universities. On the other hand, the signature of a joint declaration in which the promotion of quality in equity in their institutions is an urgent matter, as well as spreading this idea around their context of influence. 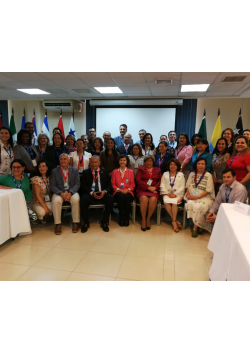 The ORACLE project aims to be a space for the exchange of experiences, the elaboration of studies and the proposal of lines of action focused on the improvement of inclusion and equity in Latin American higher education institutions. The focus of analysis are students, administration and services staff and the faculty that is part of the analyzed institutions. In its initial phase, the observatory comprises 30 Latin American institutions, and 5 European universities participate as associates. This project lasts 36 months, started in 2016 and will run until 2019.